Au Fond Du Temple Saint (Duet From The Pearl Fishers). 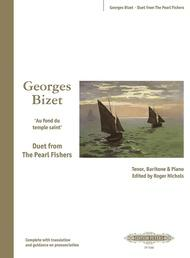 Composed by Georges Bizet (1838-1875). Edited by Roger Nichols. For tenor/baritone voice duet and piano accompaniment. This edition: New edition. Classical Period. Difficulty: medium. Vocal score. Duet notation, piano reduction and introductory text. 25 pages. Published by Edition Peters (PE.P07588).With duet notation, piano reduction and introductory text. Classical Period. 9x12 inches.Duet for Tenor and Baritone. Complete with translation and guidance on pronunciation.